As we see markets and needs moving, Hyperpro develops steering dampers not only for sport bikes, but for naked and all road bikes also. These bikes show an uncomfortable steering movement at “higher” speeds. This can be solved by simply installing a Hyperpro steering damper. 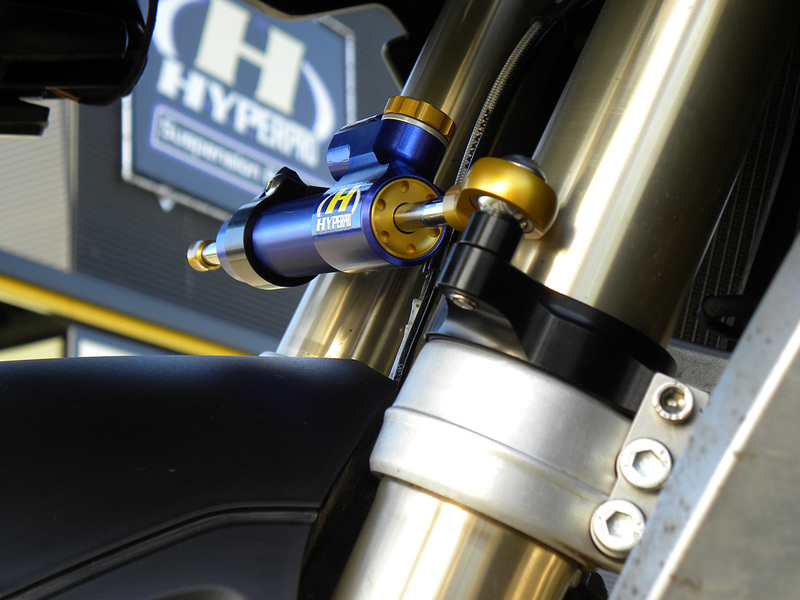 The Hyperpro steering dampers have proven for years that they give great support to the rider. Hyperpro developed a steering damper mounting kit for the R1200GS LC with model year 2013. Installing a steering damper on this bike gives the GS-rider the safety and comfort he deserves. As this 2013 model is facing some uncomfortable effects, a steering damper seems like a basic need. Even more now BMW is mounting a steering damper as an original part from 2014 on. Next to that we developped the steering damper as an upgrade for the R1200GS 2014 models to replace the OEM damper. This conversion gives better stability on the R1200GS 2014 than the original steering damper. For this Touring and Travel bike we advise to use a CSC damper. A steering damper exists of two parts. The first part is a genius steering damper with adjustable damping in 22 clicks. Hyperpro offers this in a version with linear (CSC) damping behavior and in a version with a unique progressive (RSC) damping behavior, which reacts progressive on damping demands. The second part is the mounting kit, available in gold and black anodized, lightweight aluminum. This mounting kit is developed to meet the highest demands both on the road and on the off road track. Hyperpro for the new KAWASAKI Versys-X 300 2017! HYPERPRO FOR THE TRIUMPH MODERN CLASSIC MODELS 16-17! A free Hyperpro Bandana with every spring set purchase! Make your Harley Davidson ride even better with Hyperpro Suspension! HYPERPRO FOR THE NEW BMW G310R! Hyperpro Suspension for the new Kawasaki Z650 2017! Hyperpro for the new Kawasaki Z1000SX 2017! The YAMAHA MT-07 STREETBOX! is available!